Alvimopan (LY-246736) is a potent, relatively nonselective opioid antagonist with Ki values of 0.77, 4.4, and 40 nM for the μ, δ, and κ opioid receptors, respectively, displaying >100-fold selectivity over other aminergic G-protein-coupled receptors. Racecadotril is a peripherally acting enkephalinase inhibitor with an IC50 of 4.5 μM. Naloxone HCl is an opioid inverse agonist drug used to counter the effects of opiate overdose. JTC-801 is a selective opioid receptor-like1 (ORL1) receptor antagonist with IC50 of 94 nM, weakly inhibits receptors δ, κ, and μ.
Naltrexone HCl is an opioid receptor antagonist used primarily in the management of alcohol dependence and opioid dependence. Loperamide HCl is a selective μ-opioid receptor agonist opioid with Ki of 3.3 nM, 15-fold and 350-fold selective over the δ subtype and the κ subtype of the opioid receptor, used against diarrhea resulting from gastroenteritis or inflammatory bowel disease. Low-micromolar amounts of loperamide inhibit MERS-CoV-induced cytopathology. Huh7 cells in 96-well plates were infected with MERS-CoV isolate EMC/2012 (MOI, 0.005) in the presence of 0 to 8 μM LPM (C). Cells were incubated for 2 days, and cell viability was monitored using an MTS assay. In addition, the potential toxicity of compound treatment only was monitored in parallel mock-infected Huh7 cell cultures. Graphs show the results (averages and standard deviations [SD]) of a representative experiment that was performed in quadruplicate. All experiments were repeated at least twice. For each compound, the calculated EC50, CC50, and SI values are given. ADL5859 HCl is a δ-opioid receptor agonist with Ki of 0.8 nM, selectivity against opioid receptor κ, μ, and weak inhibitory activity at the hERG channel. Phase 2. ADL-5859 respectively ADL-5747 were dopioid agonists (DORs) which were developed as analgesics for post-operative, neuropathic or musculoskeletal pain. They were expected to have superior analgesic potency over the existing ones, due to the different receptor targeted. However their development was stopped due to unconvincing efficacy. Trimebutine maleate is the maleate salt form of trimebutine, which is a spasmolytic agent that regulates intestinal and colonic motility and relieves abdominal pain with antimuscarinic and weak mu opioid agonist effects. Tianeptine is an antidepressant agent that act as an atypical agonist of the μ-opioid receptor with clinically negligible effects on the δ- and κ-opioid receptors. Matrine((+)-Matrine) is an alkaloid found in plants from the Sophora family, which has a variety of pharmacological effects, including anti-cancer effects, and action as a kappa opioid receptor agonist. Trimebutine is an agonist of peripheral mu, kappa and delta opiate receptors, used as spasmolytic agent for treatment of both acute and chronic abdominal pain. (-)-Menthol is a levo isomer of menthol and used as a cooling agent that strongly activates TRPM8. Meptazinol is a unique centrally active opioid analgesic, which inhibits [3H]dihydromorphine binding with IC50 of 58 nM. Lobeline hydrochloride is an alkaloid that acts on nicotinic cholinergic receptors but is less potent than nicotine. 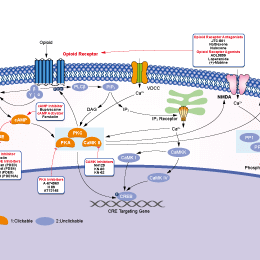 It is also a VMAT2 ligand and an antagonist of μ-opioid receptors.